It’s that time of year again! 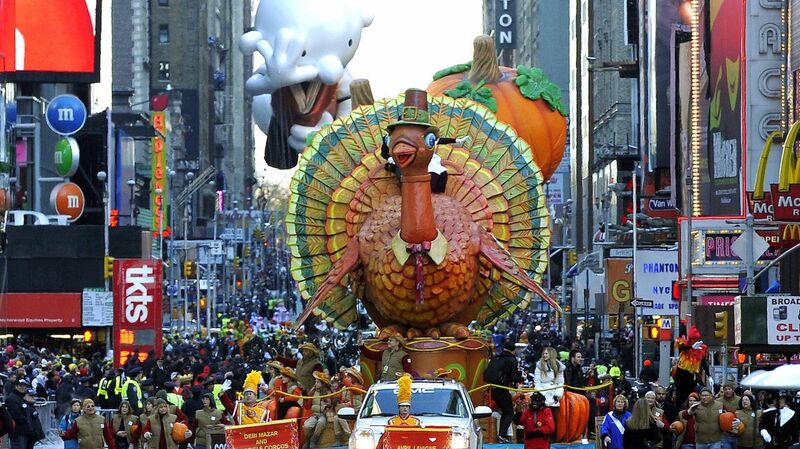 The Macy’s Thanksgiving Day Parade, a New York tradition held annually on Thanksgiving Day since 1924, is upon us. 2017 is its 91st year and it’s set to be bigly. It’s all going down Thursday, November 23 with performances from pop stars like Gwen Stefani, 98 Degrees, Andra Day & Common, Jimmy Fallon & the Roots, Flo Rida, Goo Goo Dolls, Wyclef Jean, Smokey Robinson and more. And, of course, various marching bands and dance groups from all over the country. Giant balloon fan favorites like Charlie Brown, the Pillsbury Doughboy and Spongebob Squarepants will float on by from 9am to 12 noon. New characters like Frozen‘s Olaf and Dr. Seuss’ The Grinch will make their debut, while Santa, a longstanding tradition and parade mainstay, will close out the floating festive fun. His Ho Ho Ho-ing closing out the parade and signaling the start of the Christmas season. So, how do you watch Macy’s Thanksgiving Day Parade? We’re glad you asked. There are many splendored ways to view the iconic parade: You may want to splurge big bucks on grandstand tickets, view for free from the sidelines, or simply watch at home with the smell of turkey and pie wafting through the air—the choice is yours. If you think the Empire State Building, Top of the Rock Observatory, or perhaps the Museum of Modern Art are where you want to be, then might we suggest picking up a New York City Explorer Pass and save on combined admission to the city’s top attractions. If winging it is more your speed, secure a spot on the street and watch the holiday spectacular for free. To bring this to fruition you’ll need to get curbside bright and early, and be sure to not leave once you get a good place. Hot tip: Wear lots of warm layers and comfortable shoes, pack snacks and drinks, and always be prepared for inclement weather. The good news is, there’s more than 2.5 miles of public viewing spots on offer. So while a lot of the performances happen around 34th Street (those will be the most coveted spots and the most difficult to lock down! ), there’s plenty of viewing space up and down the route to sneak a peek. There’s also plenty of hotels along the route. For a luxe alternative, book a room with a view and order in-room dining for a maxin’ relaxin’ location to see Tom Turkey and friends. If you’re interstate (or simply not willing to venture outside), fear not. NBC will be airing the parade in its entirety, with Today show hosts Matt Lauer, Savannah Guthrie, and Al Roker anchoring their official broadcast. The network has also partnered with Verizon to set up a 360-degree live stream of the parade for those of us sans cable TV subscriptions. Log into Verizon’s YouTube channel when the parade starts and you’ll be able to watch the action in real-time.